The McGrath homestead in Northfield, Vermont. My family never celebrated St. Patrick’s Day at our house. When I got older and realized how Irish I was, I asked my mother why. She said she did not approve of all the drinking and she wanted her children to identify with their English background. Also, my father’s Protestant relatives from Boston were very prejudiced against Irish Catholics; they had a false sense of superiority because their ancestors had settled in Massachusetts starting in 1629. To avoid fights, my mother said as little as possible about being Irish. It was only towards the end of her life that she started to talk more about her Irish heritage, and when I visited Ireland she was very proud of me. Two of my great-grandmothers were Irish – Bridget McGrath and Mary Ellen Cullen. 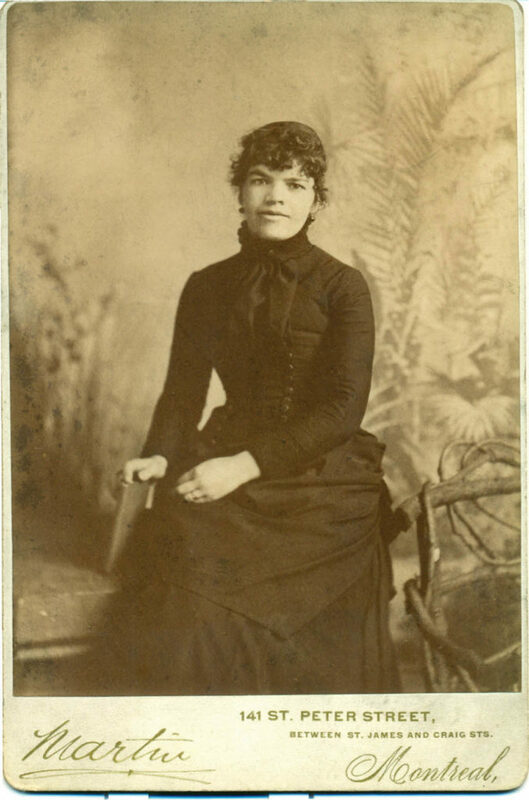 Bridget was born in Northfield, Vermont in 1851; her father was born in Ireland. According to my mother, Bridget was hard working and there was nothing fancy about her. Every night she would sit in her rocking chair by the furnace vent in the dining room and say her rosary. There are dozens of religious statues and pictures belonging to Bridget in the house, which I saved out of respect for her memory and her hard work. 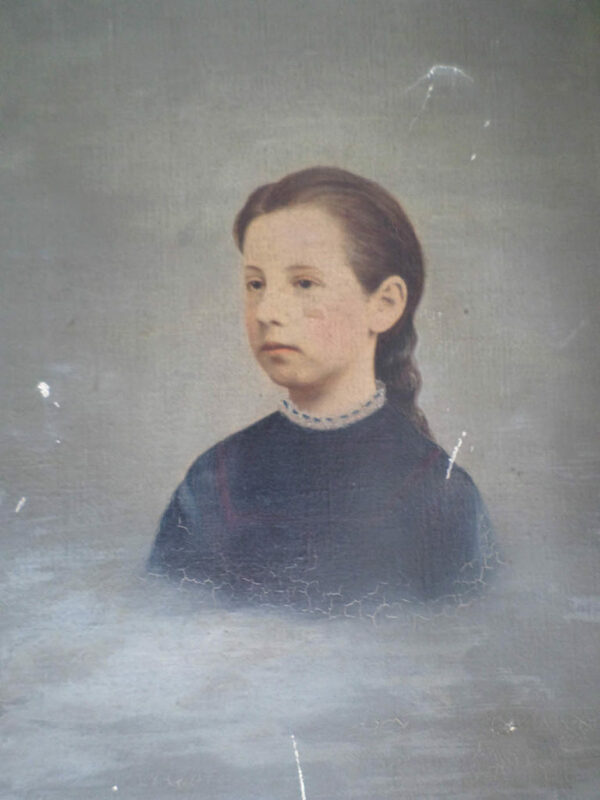 I have a picture of Bridget standing in front of her family’s farmhouse when she was a young girl and a portrait of her when she was about ten years old. Bridget McGrath Reeves, c. 1860. Mary Ellen Cullen, my maternal great grandmother, was born in Dublin and came to Montreal with a steamer trunk containing her pink-trimmed bone china – she was not poverty stricken. My family’s most precious sentimental heirlooms are stored in this trunk and I still have her china. My Irish ancestors travelled, independently, to the port of Montreal, like most of the forbearers of the old Irish in Burlington; they were not brought here in groups to be servants like the later Irish immigrants were. Both of my Irish great-grandmothers married men of English decent, perhaps in hopes of upward mobility and to assimilate into a group where they would not be discriminated against. My grandmother of English-Irish heritage from Montreal became an American citizen, but she never gave up her attachment to her Canadian background. I remember as a child going to her house and finding her crying; it was Queen Elizabeth’s birthday. However, she was very intent on having my mother celebrate all the American holidays. Her family were members of St. Patrick’s Cathedral in downtown Montreal and she saved their baptismal, first communion, and confirmation papers, which I still have. She told my mother stories about the town her father, Aaron Martin, was from on the southern coast of England but she never mentioned stories about Ireland, other than that Mary Ellen Cullen was from Dublin. I am the last of old Irish to still live in their original family homestead in Burlington, Vermont. My great grandparents, Bridget McGrath Reeves and her husband, Sheriff Reeves, bought our 13-room house, with a carriage barn on 10 acres, in 1894. 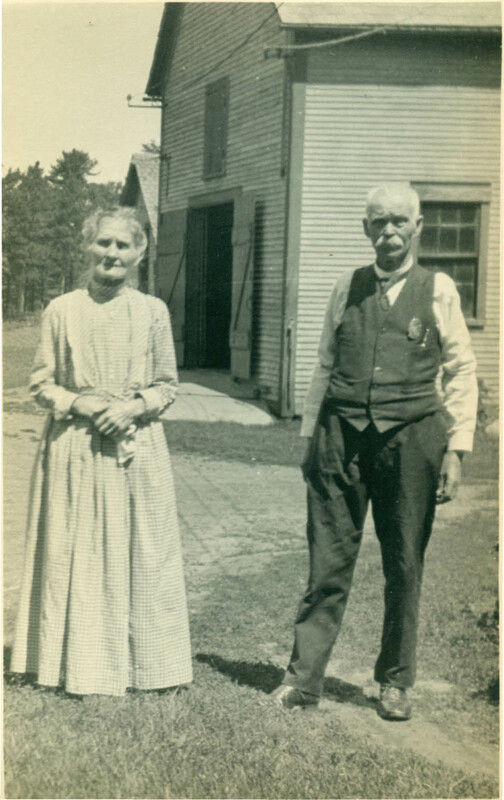 Bridget McGrath Reeves with her husband, Sheriff Reeves, in Burlington, 1924. They moved to Burlington in the early 1880s. My great grandfather was the county sheriff and he oversaw the construction of the jail house located in downtown Burlington. Bridget prepared all of the meals for the inmates and my mother always said these men never ate as well as when they were in jail. Unlike most of the Irish, they had only one son; and they worshipped him. When the Irish in Burlington started to buy houses, they bought ones near each other out of necessity to protect themselves and their children from discrimination, including from the Ku Klux Klan, which was active in Burlington at that time. Nearby in huge houses lived the McAuliffes, the McSweeneys, the Learys, the Wrights, and the Whalens. My mother knew the names of the all the brothers and sisters in these families, where each family lived, and when they moved away. Aaron Martin, Mary Ellen Cullen’s husband, right. These families surmounted the prejudice against Irish Catholics in the area by banding together, finding their niches, working hard, and providing a good Catholic education for their sons and daughters. They were prosperous and wanted their children to get ahead and not be subjected racial and religious prejudices. They sent their daughters to the private Catholic girls’ school, Mount St. Mary’s Academy, where they took private piano lessons, watercolor painting classes, and designed and painted bone china. By the turn of the century, Burlington’s old Irish had live-in housekeepers and summer camps on the lake near each other. Many of their sons became physicians or lawyers and they had started to control city politics. 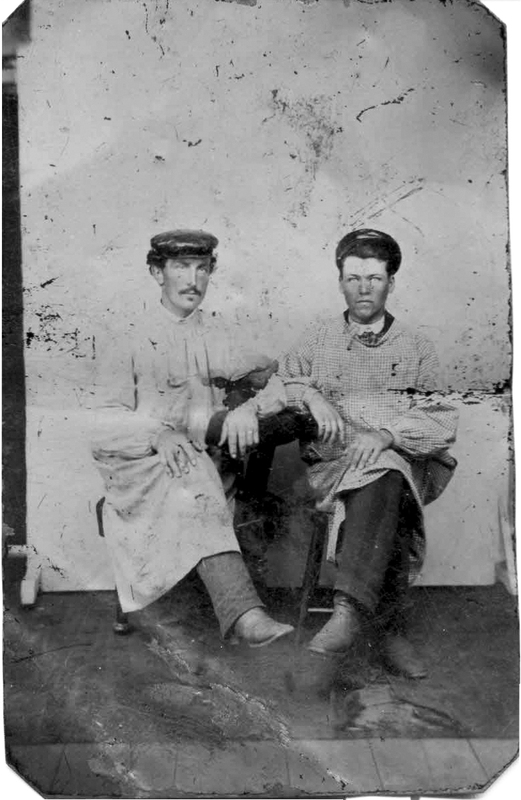 Their fathers, except for Dr. Patrick McSweeney, were merchants in downtown Burlington. One owned a stationary store, another a hardware store, and another a clothing store. My grandfather, J. Edward Reeves, owned a drug store, which he sold to buy a lumber and cement factory. All of these men were Fourth Degree Knights of Columbus. The Catholic Church was the center of their lives. 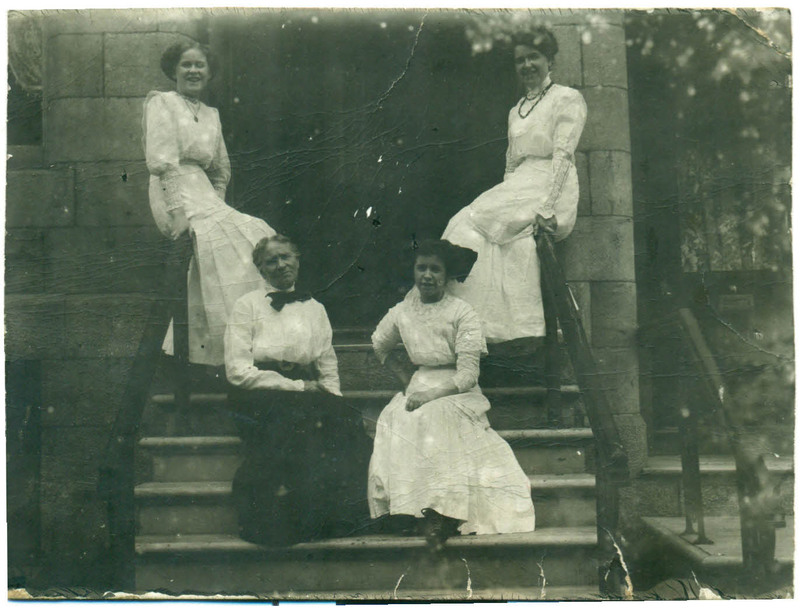 Mary Ellen Cullen (below left) and her daughters in Montreal. With hard work, frugal living, and astute business skills, my great grandparents soon had a full-time hired man to help with the farm chores, a second hired man to help my great grandmother with the washing and heavy housework, and a bookkeeper who came in once a week to work on the accounts – they bought real estate, including the six houses in the Irish Hill area that I still own, several farms, and a thirty-six acre lot of land in the industrial area. By the time their only son was engaged to be married in 1912, they were prosperous enough to give him and his bride a fully-furnished seven bedroom Victorian house adjacent to theirs. These are the kinds of stories that need to be told. I remember my mother, who grew up in Pennsylvania, talking about how if you were protestant the catholic teachers were mean to you, and vice versa. She recalled the neighborhood by their ethnic identity. She was proud to be English and Irish. But she was fairly prejudice against those “not like her” … and I believe she carried that throughout her life. I never understood it, and to read your story and look at the beautiful faces, I cannot fathom what it must have been like … not that long ago. They really did create their own “clan” and that makes me smile. You have a rich and valuable heritage, so much to be proud of as you obviously are. I admire that you have remained “where your roots” are and just a little bit envious. Blessings to you and yours. I am trying to find anything about Patrick Henry McGrath (1873-1950) and back. I’m not sure where Bridget comes into the tree but if anyone has any information, stories or pictures it would be greatly appreciated! Thanks! Margaret Foley , born in Waterford Ireland 1845 , married George Jepson, they lived in Burlington VT. My great grandmother, her son Leon was my grandfather. My father Edgar Jepson . I’m Edgar W. Jepson Jr. live in Greenfield, Massachusetts. Mistake Margaret Foley , lived in Bennington, Vt. With her husband George Jepson . Not Burlington Vt.
That Irish-English potion, so potent! Of course, the English are recent arrivals to our part of the world, and they had to work so hard to compete. They did very well. What bullies, though – and God bless the Irish who seem to have had a bottomless well of Irish genius and courage to draw from.